Winning prizes at the Tertis International Viola Competition is generally a good indicator of promise. Causa won the Schidlof and Barbirolli Prizes – one for “the most beautiful sound”, a quality Tertis always keenly stressed. Causa was born in Naples where he studied at the Conservatory – subsequently with Lysy, Menuhin and Johannes Eskar. A 1996 scholarship saw him working with Michael Tree in New York. He has since been active as an orchestral and chamber player and also as a soloist and he’s currently Professor of Viola and Chamber Music at the Menuhin Academy in Switzerland. Tonal beauty is certainly on show in this selection of transcriptions and given the Romantic qualifier we can be assured of some sensitive and refulgent playing. His viola is a modern French one as near 17 inches as makes no difference – so a little larger than one with which many younger players would be comfortable, though of course amongst older players Vadim Borisovsky’s was over 17 ½ inches and Tertis, who was a very small man, played a monstrous Montagnana of 17 1/8". Some of the transcriptions are by Borisovsky – though none is by Tertis – and others by Causa himself. Other prominent soloist-transcriber names include Katims and Forbes. Tchaikovsky’s Valse sentimentale is beautifully phrased and the Glazunov-Causa team takes the viola high in Saint-Saëns’s Allegro appassionato – note how the violist maintains vibrance even in the highest positions. Borisovsky’s work on the Prokofiev is tangy and idiomatic whilst by contrast Causa’s Lerchengesang of Brahms is intimate and delicate. Watson Forbes’s Brahms Hunagrian Dance transcriptions are full of verve even if, to my ears, Causa does something odd with the rhythm of No.1 [track 11]. The Third is much better. 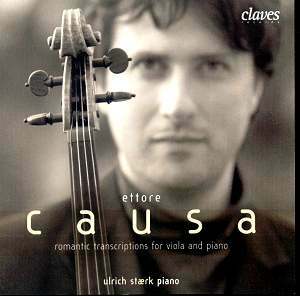 Ulrich Stærk plays with sensitivity throughout. With warm recording values this is an enjoyable calling card for a tonally highly accomplished musician. It might have added to the job but a few biographical notes on the transcribers, the works, and the work of viola transcription in general would have been welcome.